In Antidote, you are a laboratory scientist working for a giant chemical research conglomerate. When a deadly toxin suddenly infects you and everyone in your lab, you must work quickly to share your research and discover the Antidote before it's too late. In the game, players take turns deciding what action all other players take: either discard from their hand or trade research with other players. Eventually all your cards will run-out and you will be left with just one that you must 'drink' and hope its the Antidote. If this card is the true Antidote, you're cured and live to play again! If not... you die, but you can always try again! 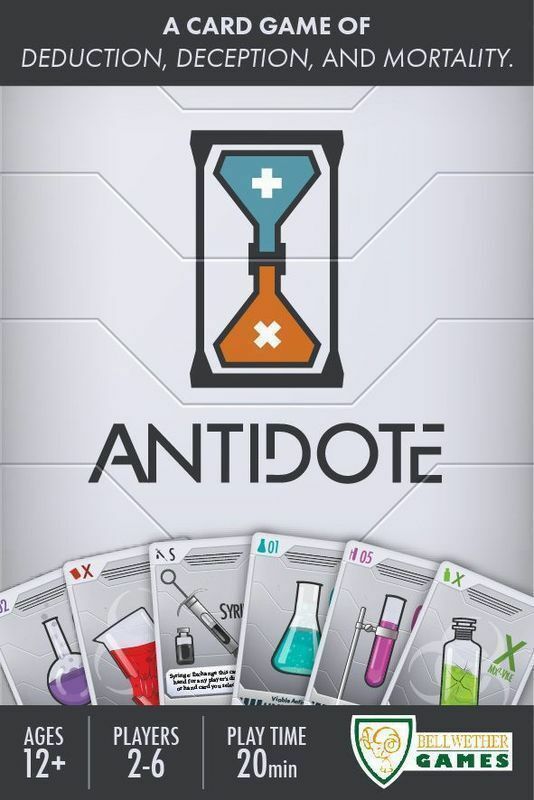 Antidote has 6 core elements: Deduction: Players 'live' or 'die' by deducing the one card type that has been removed from the game (similar to Clue). Semi-Cooperative Gameplay: You live or die alone, but it may be impossible to deduce the Antidote without working with the other players. Simultaneous action selection: Every turn involves every player. Whether it is making trades for valuable information or simultaneously declassifying your research, all players are constantly engaged. This makes the game experience more fulfilling and eliminates long-periods of 'down-time' between turns. Player-controlled game length: Players have sole control over the pace of the game. If you think you know the answer you can speed the game towards its conclusion. If not...well, don't hold your breath! No one is going to wait for you to figure it out! This element adds a feeling of tension and excitement. Multiple levels of player interaction: Even a 'wink' or a 'nod' can have meaning in this game if you are trying to learn or pass information between players. At the same time, a blatant statement such as 'Blue formulas are toxic' may have no meaning at all, but everyone will judge you by your actions (everyone can see the cards you choose to discard). Surprise ending: It is unlikely that anyone can know with 100% certainty what the Antidote is by the end of the game. This means the revealing of the Antidote is often a surprise.